LayerZero Power Systems Static Transfer Switches save all events into a timestamped "Black Box" for analysis and post-incident reconstruction. All events are documented in the internal "Black Box", and may be viewed as "summarized events" by users on the "Event Log" page on the eSTS GUI. Access to black box data is accessible both locally and remotely. Some events cause the action of posting an alarm, while other events cause the action of clearing an alarm. LayerZero Power Systems provides an ‘Alarms Troubleshooting Reference’ document which provides a list of each alarm message, the urgency that it indicates, a description of what can cause that alarm, and a description of the steps to perform to troubleshoot the alarm condition. 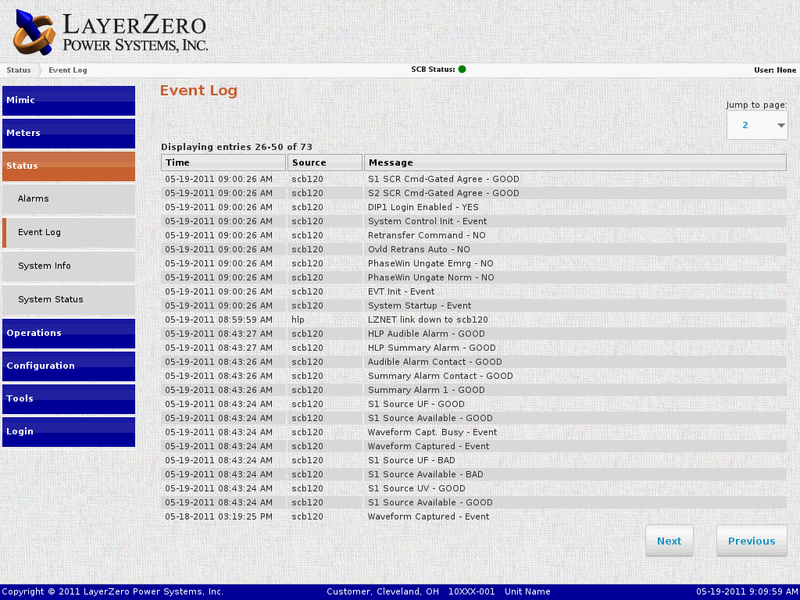 Full and complete event data is stored internally, and this data can be analyzed when needed by LayerZero engineers. 3. Event records only take a snapshot of the actual event and provide no information regarding the status of equipment parameters before and after the event. 4. Some events are missed entirely. A natural outcome of these shortcomings is that eradication of the root-cause of the alarming event does not occur. The event then systematically becomes an "out-of-the-ordinary" academic acknowledgment. Conventional power event recording schemes do not satisfy the needs of the modern, sophisticated facility engineer who needs "quality" information. 3. Provide a real-time status indicator of all machine parameters at the exact instant of each recorded event. A High Level Processor is supplied with a compact flash disk. Communication is via fiber optics and the result is a "Black Box" data recorder. Event logs, alarms, diagnostics and Waveform Capture are accessible via a VPN Router that comes standard with each unit. Time-stamping resolution is 10 microseconds; fast enough to catch any mechanical or electrical activity. Each transfer event as well as transfer-inhibit event is captured and stored on solid state memory in the form of a real-time waveform capture three cycles before and three cycles after an event. The root cause analysis of the electrical system is facilitated by the Black Box.